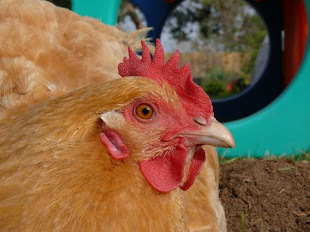 Chicken Blog: Thank You Betty! Thank You Fantam! Thank You Wisconsin! Thank You Betty! Thank You Fantam! Thank You Wisconsin! Fantam laid her first egg! Dear fluffy, plump and lovely Fantam the Dark Bantam left us a petite oeuf. And what does one do with fresh oeufs? How about breakfast crepes... or creeps as we affectionately call our amateur attempts at the French classic. We could have tried omelets, but we already ate Aunt Carol's wonderful Bucky Cheese! So we settled on another taste of Wisconsin, courtesy of Laura, Gary and Sophie. Direct from the North Woods and just as tasty as can be with real maple syrup, pancakes, aka creeps. Sometimes we call them Hencakes. Now we go forth and greet the brand new day. Amazing! I love the Hencake! I would make them if my kids would eat them! Why don't they like pancakes??? So cute when they're shaped like a hen! Chicken pancakes! Yummy! With chocolate chips even better! A chicken pancake! Love it. So wonderful! I love your hencakes, who wouldn't want to eat them. Our friends get about a dozen a day, but then they have 20 birds. I always have fresh eggs (not to rub it in!) I eat a lot of hard boiled eggs as snacks. (But then the size of the eggs are about half that of normal chicken eggs if you remember my post of Nov. 3, 2008). May you have many future egg dishes. I'm jealous - such a wonderful life, chicken pancakes and all.